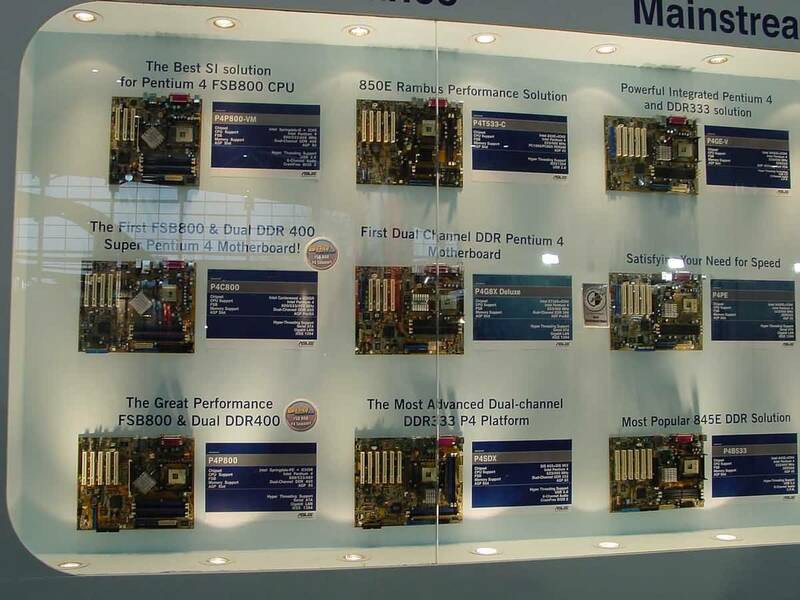 ASUSTeK is a world leader in mainboard production and one of the heavyweights in making graphics cards. 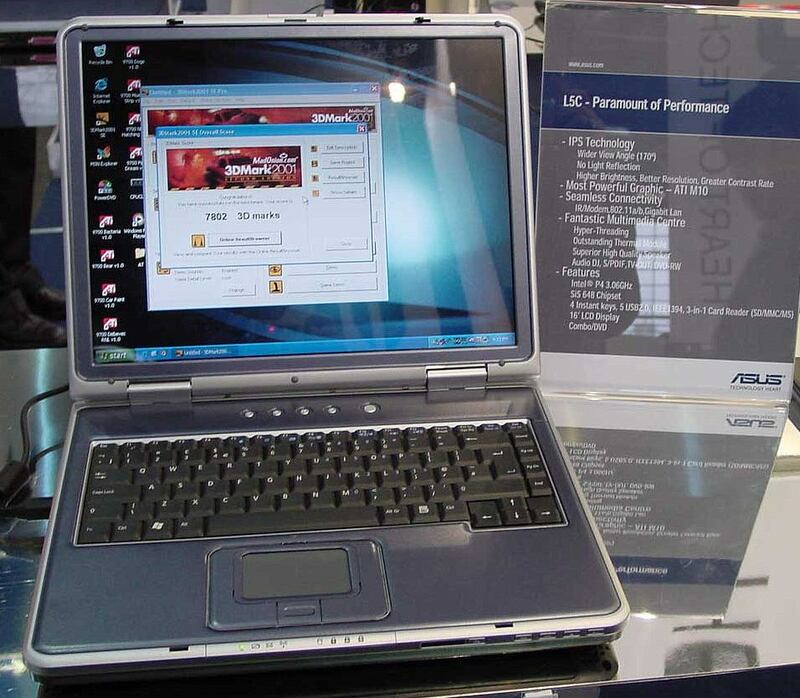 The company also offers a wide range of other types of products from high-performance notebooks to PDAs and mobile phones. 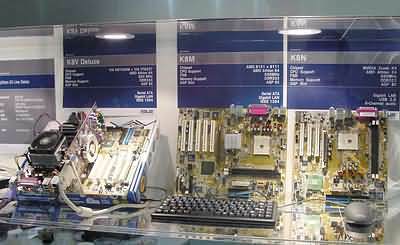 At the display they demonstrated a great heap of mainboards for Intel Pentium 4 and with FSB 800 MHz support. You can click on the photo to enlarge it and get details on the exhibits. Below are mainboards for AMD K8 platform. As you can see, the company is entirely ready for the new processors. 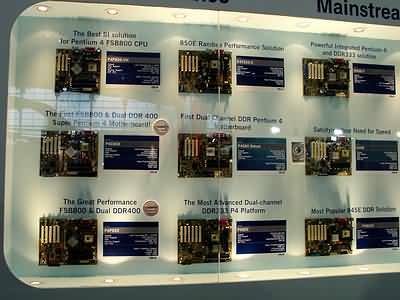 At the photo below you can see the names and characteristics of the boards. Among a great variety of notebooks displayed there the most interesting solution is L5N: 16" LCD, 3.06 GHz Pentium 4, SiS648 chipset, and ATI M10 graphics. It hit the score of 8000 in 3DMark! 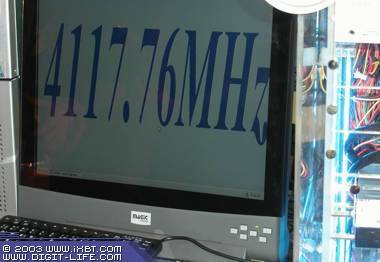 Beside L5N, ASUSTeK Computer brought there S1N, M2N and M3N series. Each of the notebooks includes three components compulsory for Centrino platform: Pentium M, i855 chipset and Intel PRO/Wireless 2100 adapter. The single-spindle series of S1N notebooks is built on 13.3" LCD, comes with a 4-in-1 card reader (SM/SD/MS/MMC), and has a bay for a DVD/CD-RW drive or second hard drive. 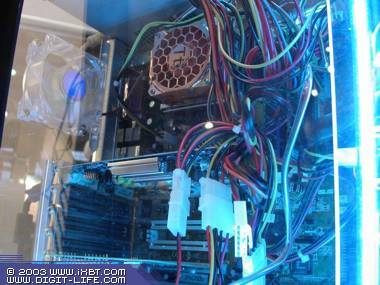 This model supports ASUS Power4 Gear and ADTD II, and is able to run during 3.5 hours. S1N weighs 1.8 kg. It's thickness is approximately 18 mm. The double-spindle M2N series is equipped with a 14.1" LCD, and a 4-in-1 card reader (SM/SD//MS/MMC). It also has an additional bay for a Combo DVD/CD-RW drive or a second hard drive. 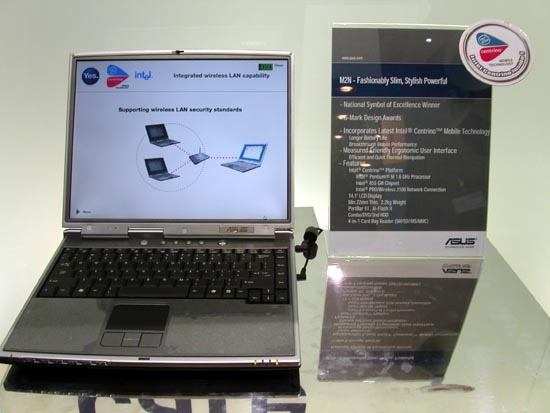 The model supports ASUS Power4 Gear and ADTD II technologies and sports rundown time of 5.5 hours. The M2N models weigh 2.2 kg. Their side panel is approximately 22 mm thick. Finally, M3N notebooks feature a 14.1 LCD and have a 4-in-1 card reader (SM/SD//MS/MMC). Also, they offer 4 USB 2.0 ports, Bluetooth adapter and an additional bay for a DVD/CD-RW drive or second hard drive. 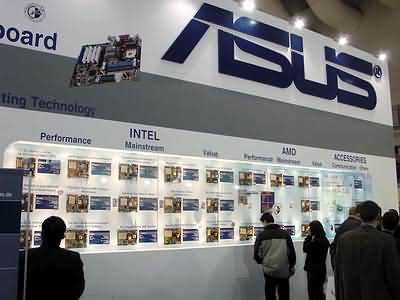 ASUS Power4 Gear and ADTD II technologies are supported. The rundown time is already 8 hours! M3N models weigh 2.2 kg and are 22 mm thick. 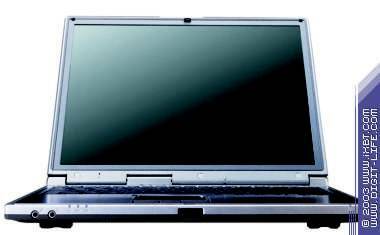 L5C and A2H models integrate an LCD matrix with a viewing angle of 170 degrees. Few CRT monitors have such angles, not to mention LCD panels. Your mobility will be even more mobile if you replace a notebook with a PDA. ASUS offers its own solutions in this sphere. MyPal A620 is built on Intel PXA255 400 MHz, carries 64 MB SDRAM and 32 MB Flash ROM. The screen resolution is 240x320 pixels at the weight of the PDA of 141 g. The computer runs under Microsoft Pocket PC 2002 OS. If you can't stand typing text by clicking on letters on the on-screen keyboard, you can use a folding full-size keyboard. It was quite a surprise to find out that ASUSTeK started making mobile phones. It offers a broad range of models from a stylish GSM/GPRRS model AGP-60 with a monochrome blue OLED screen to a feature-laden GSM/PRRS smartphone AGP-600 running under MS Smartphone Ozone OS. 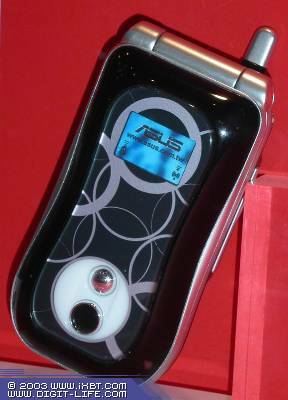 It has a color display, a built-in digicam, Bluetooth module and MMS, Java support. No information on release time or prices is known yet.